PIONEERTOWN – Pat Sullivan, civil engineer, Public works Office, at the Marine Corps Base, joined with Pioneer Pass Pushers in a study of construction problems along the route from Pioneertown to Big Bear. The road, once label the back road to Big Bear by desert citizens, is now called Pioneer Pass, and the Pioneer Pass Pushers are getting ready for they’re big pioneer past weekend April 18, 19, went VIPs, Pushers and Peons will unite to smooth out the rough spots along the road so that it will be negotiable by ordinary cars when summer comes. 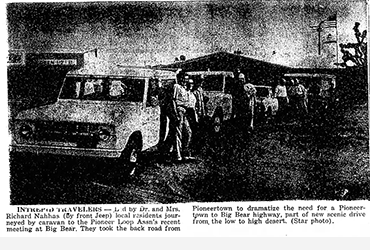 About 20 people were in the group which met at Pioneertown’s Red Dog. They went up the road toward Big Bear as far as the last ridge before Arrastre Creek. Here the snow stopped them. Sullivan walked over most of the 3-mile bad stretch on Three Hells Hill below the Rose Mine and made notes as he walked. In his opinion the main problem in the repairing the road is drainage. The slide area where several years ago the Valle de las Vista Club of Twentynine Palms worked on the road attractive Sullivan’s attention. After a thorough check of this rugged stretch of the road, Sullivan said he saw nothing that was more difficult that a simple engineering problem. Men and equipment can go a long way in improving the road, he added. 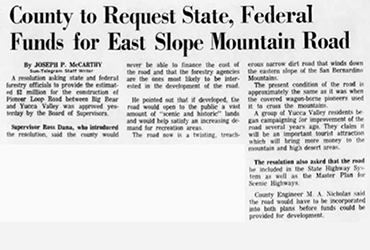 Sullivan advocated Advance planning to ensure that Pioneer Pass weekend would be a success. All material needed should be home and placed in possession before the workers arrive, he said. Sullivan suggested that the working crews be kept small with 21 men to a crew. One would be a working foreman. 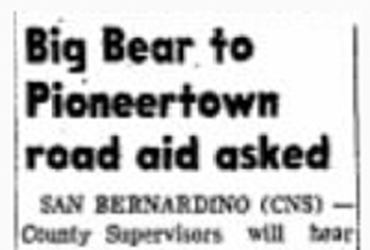 Sullivan was reported enthusiastic about the project and about opening the country between Big Bear and Pioneertown. Making the engineering survey were Mr. and Mrs. Pat Sullivan and children from Twentynine Palms; Larry and Adie Harley and son, Robert, of Norwalk; Mr. and Mrs. Armen Gamperling of Joshua Tree; norm Granger and son Tommy, Mr. and Mrs. Ken Bonser, Mr. and Mrs. Ted Morton, Mr. and Mrs. Charles Valentine, all of Yucca Valley; and Jerry Moore of Twentynine Palms.